Over the past several years, automated flash chromatography has evolved to include in-line mass detection. Typically, these single-quadrupole mass detectors are outfitted with either an atmospheric pressure chemical ionization source (APCI) or an electrospray chemical ionization source (ESI). 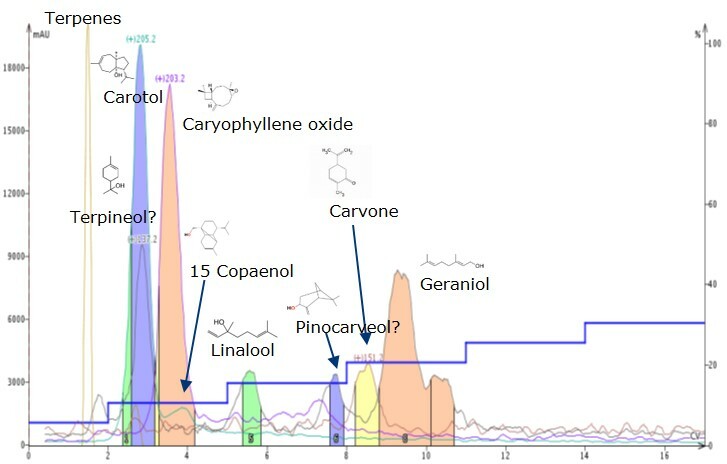 While this technical advance in flash chromatography has helped chemists detect and isolate pure compounds with a known molecular weight, verifying the identity of that compound can sometimes be a challenge as the detected mass may not match that which you expect due to fragmentation and/or adduct formation. In this post I will offer some assistance in determining adducts and fragments. I have encountered the above problem several times over the past few years. I dilute my sample to a much lower concentration and inject it into the mass detector expecting to see either the M+H (positive ionization) or M-H (negative ionization) for each of the sample components only to see some m/z responses that do not match that of the compound’s formula weights plus or minus a hydrogen ion. So why is that happening? Well, depending on the chemical structure what can happen is adduct formation and/or compound fragmentation. Adducts can form between a molecule and one of the solvents in which it has contact (e.g. MeOH, MeCN, water, or DMSO). Adducts can also form with available ions from added buffers, acids, or bases (e.g. Na+, K+, NH4+, Cl–, Br–, etc.). Fragmentation occurs if the detector’s energy is sufficient to actually remove or cleave a functional group such as –OH in the form of water loss (M+H-H2O) or –OCH3 in the form of methanol loss (M+H-MeOH). For me, I have seen this occur with compounds like dextrose (MW 180), using negative ionization and an ESI source. Expecting to see M-H (179) for dextrose, I was surprised to see a mass of 225, which I later determined to be the M+formic acid-H adduct (M+45) after a bit of arithmetic, Figure 1. Figure 1. ESI detection of an artificial sweetener containing dextrose (m/z 225), acesulfame-K (m/z 162), and aspartame (m/z 293). Dextrose is detected as a formic acid adduct (M+FA-H), acesulfame as the M-K fragment, and aspartame as the M-H ion. As another example, I recently explored purifying carrot seed oil, which contains terpenoids almost exclusively, and lots of them, Figure 2. Finding the primary compound, carotol (MW 222), was quite a challenge. Direct sample injection in my APCI-equipped Biotage® Dalton 2000 Flash LC-MS provided many m/z responses in positive ionization mode but there was no M+H of 223. Negative mode did show a m/z of 221 for the M-H. That said, I knew carotol was in there but the mass detector response in negative mode was not really strong and not likely useful for fractionation in the upcoming purification. So, to help me discern which compound a certain m/z I have detected might be, I created a reference table to make it easy. The beauty is that table automatically calculates all the possible adducts and fragments in both positive and negative mode from the compound’s stated MW. Using this table and the known MW for carotol, I determined that the reason I could not detect carotol using positive ionization mode was because the compound fragmented, losing water (M+H-H2O), to yield a detectable mass of 205 (M+H-18). Likewise, the same sample generated a strong positive ionization response of 203. As it turns out, the m/z 203 could be one of two compounds in the oil. One of the possible compounds was determined to be caryophyllene oxide as the M+H-H2O fragment with the other decalactone as the M+H+MeOH adduct. Interestingly, none of the other 65+ reported compounds’ M+H, adducts, or fragments equal 203 meaning the response must be one of these two compounds, but which one? After purifying the oil using normal-phase purification (Figure 2) where I targeted MW 203, 205 and two other prominently detected masses (151 and 137), it was obvious that most of m/z 203 is comprised of a single compound eluting between 3 and 4 CV (column volumes), with much smaller responses later in the run. Unfortunately, this data alone was not sufficient to verify compound identity so I re-analysed fraction 4 (MW 203) using the Dalton 2000 Atmospheric Solid Analysis probe (ASAP) and found a new m/z of 262. Using the adduct and fragment calculator I determined the only compound that could produce this mass is caryophyllene oxide as the acetonitrile adduct. Compound ID confirmed! Figure 2. Purification of carrot seed oil by normal-phase flash chromatography with APCI mass detection. So, for those of you using a mass detector, you too may find the adduct and fragment calculator useful. To download a copy, please click on the link below. Thank you for making this blog a success and please take a minute or two to take the survey so I can learn more about your blog improvement ideas and other topics about which you want more information. Another fine article Bob. From what I know about MS, adducts can often be broken up by increasing voltage. Is it possible to adjust this setting in Isolera Dalton? Good catch on the figure number, and thank you for the complement. With our mass detectors we want to keep the variables to a minimum. We have set parameters such as ionization source voltage and temperature to values where they can work with the broadest application range so the user does not need to adjust them. Previous Previous post: What impact do buffers have on APCI mass detection? Next Next post: What is the optimal sample to sorbent ratio for dry loading in flash column chromatography?